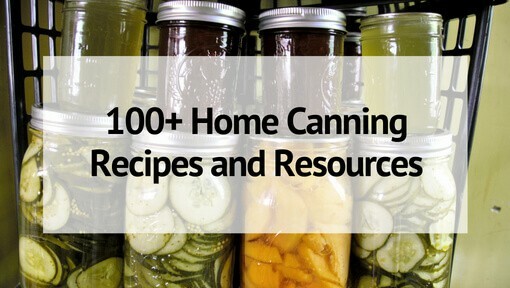 When you are just starting out with canning, it can sometimes be confusing as to what foods can be preserved in a water bath canner versus which ones can be canned in a pressure canner. 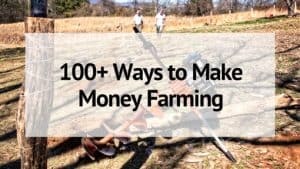 If you are a beginner, I suggest starting with a water bath canner. They are easier to learn and easier to use. 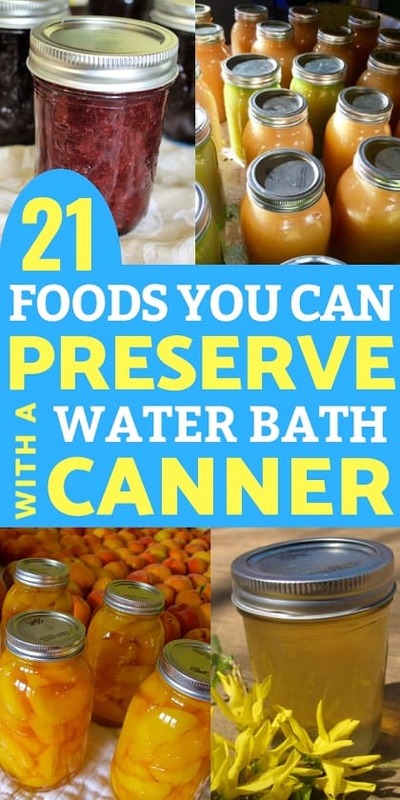 Below are 21 foods you can preserve using a water bath canner. 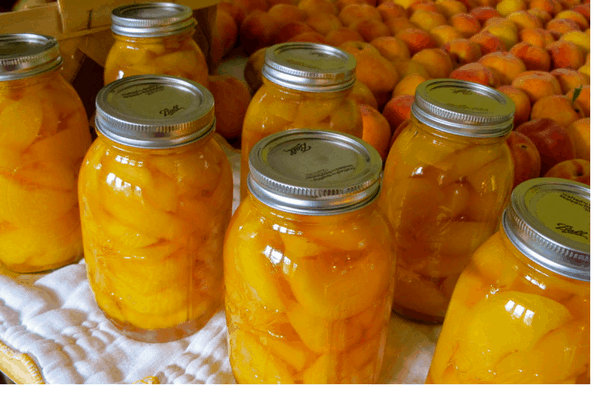 Peaches are one of my very favorite things to can each summer- and they are great for water bath canning! You can can them as halves or slices. You can add a sugar syrup- or if you don’t want that added processed sugar, you can can them in half water/half juice! You can get the full directions on how to can peaches here: How to Can Peaches in Juice! Get this water bath canning set– it includes everything you need to get started canning! The pot, the rack, and all the tools! Like peaches, pears are a great starter food to can in a water bath canner. You can can them in halves, slices, or even make them into pear sauce! Get the directions on how to can pears here: How to Can Pears without Sugar. Applesauce is the first thing I ever canned. We made it every year when I was a kid, and I have continued the tradition with my own kids. If you have a strainer, applesause is so easy! No peeling, no coring! Just chop up the apples and you are ready to get started! You are probably seeing a theme in these first foods- they are all fruits! Fruits are great for canning in a water bath canner because of their high acid and sugar content. Plums are another great tree fruit to can in a water bath. Here’s a great recipe for canning plums in syrup. 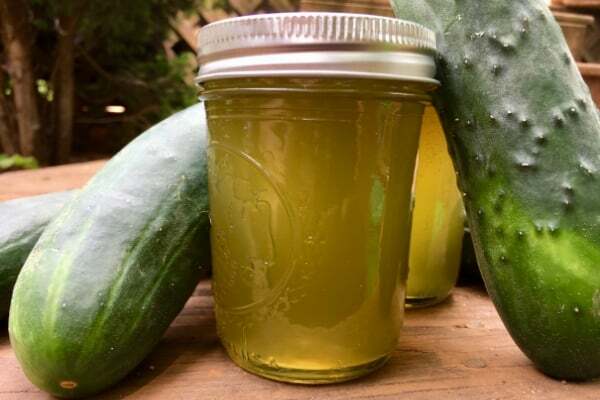 Pickles are a very acidic food due to all of the vinegar in the recipes. So take your favorite veggie and see if you can water bath can a version of them! Relish is a staple in many households. And it’s another food you can make yourself at home- and can in a boiling water bath! I make mine with chopped cucumbers, onions, garlic, and spices. 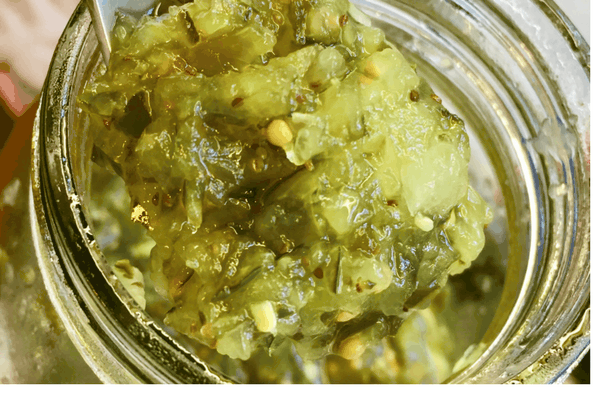 Here’s my cucumber relish recipe– along with directions on how to can it. If you have access to cherries, they are absolutely wonderful to can and keep on your pantry shelf. The one downside to canning cherries is the pitting! But if you get a handy cherry pitter it will go so much faster! Simply Canning has a great tutorial on canning cherries, with recipes from no sugar to heavy syrup. Berries are another high acid food that can be preserved in a water bath canner. Blackberries, blueberries, raspberries, huckleberries, elderberries! Here’s how to can these berries at home! If you make a lot of pies, or maybe if you are just tired of canning plain fruit, pie fillings are a great option for water bath canning. Fruit preserves are probably one of the most popular first foods for beginning canners. You can make preserves out of most any fruits- blueberries, strawberries, peaches, etc. Here’s my recipe for Honey Peach Preserves or if you prefer strawberry, here’s my strawberry preserves recipe. Apple butter is definitely a fall favorite for a lot of people. And we can’t make applesauce without also making a batch of apple butter! I like to use a crock pot to cook down my apples, plus it makes the house smell wonderful as it cooks! Here’s A Modern Homestead’s Crock Pot Apple Butter recipe! I’ve already talked about preserves, and maybe you don’t know the difference between Jam and preserves? The biggest difference is the use of pectin. Jam has pectin, Preserves do not. 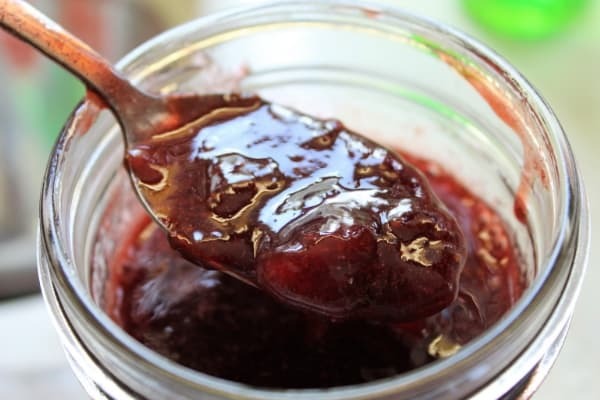 So just like preserves, jam is super easy to make using any fruit you wish! So grab your canner, your fruit, and your pectin– and make some jam! Almost all boxes of pectin come with an insert with jam instructions for most fruits. Now there’s jelly! The difference with jelly is that is uses pectin AND it is made from juice only. I tend to make jam or preserves with my fruit, BUT I do love to make flower jellies with things like forsythia, red bud, or violets. I tried my hand at cucumber jelly! Here’s my recipe for Forsythia jelly– give it a try next spring! 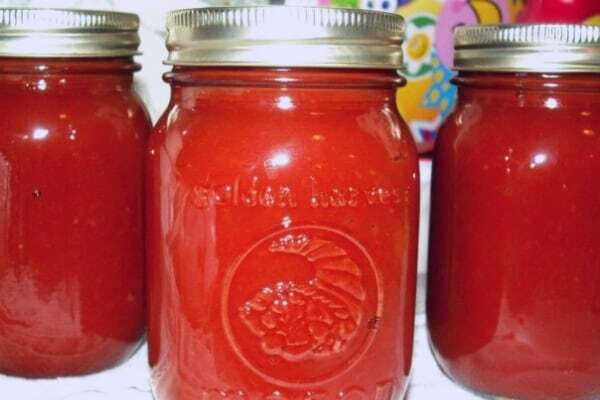 Tomato sauce is a staple in many households, and luckily it’s one of the foods you can preserve in a water bath canner! Be sure to use a tested recipe and add in acid such as citric acid or vinegar to make sure your sauce has a high enough acid level to safely can. I personally freeze my roasted tomato sauce, because I don’t like to peel, skin, and be stuck to only adding a certain amount of garlic! But there are some great tomato sauce recipes out there. Salsa is another very popular home canned food. And it is great to have a stockpile of salsa sitting in your pantry! Again, be sure to follow a tested recipe- and pay attention to the measurements of tomatoes, peppers, onions, etc. Check out my Food Preservation Planner to help you preserve more with less wasted time! Includes cheat sheets, planning pages, checklists, and more! Did you know you can make and can this holiday staple yourself? No more cranberry sauce in the shape of a can! Here’s a great Ball tested Cranberry Sauce recipe to try out this year- just in time for the holidays! Yep- you can can juice in your water bath canner too! So grab your juicer and jars and make some homemade juice! Homemade ketchup is absolutely wonderful and if you’ve got a lot of tomatoes it’s a great food to can in a water bath canner. Be warned, it takes a LOT of tomatoes to make a little bit of ketchup! And it takes all day to reduce down. Here’s a great ketchup recipe to try out. Grilling is big in the summer, and you can make a splash with homemade, home canned BBQ sauce! Like many tomato based products, BBQ sauce can be preserved in a water bath canner. Like always- remember to use a tested recipe and follow the directions! Here’s a BBQ Sauce recipe to get you started. Yep! You can CAN salad dressings too. Not all dressings, but most vinaigrette can be canned in a water bath canner because of their high acidity. Stop buying store bought and can your own! Here’s a Strawberry Vinaigrette to get you started. Water? Yes! You can can water too. You may ask yourself WHY you would want to can water, but if you live in an area that has natural disasters or something like that, you may choose to can you own water as opposed to buying water jugs from the store to save for emergencies. And there you have it 21 common foods you can preserve using a water bath canner! Which is your favorite thing to preserve? Hi!! 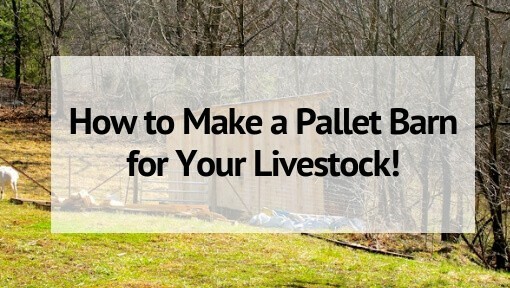 I just came across your post on Pinterest! I love all your ideas! So I just started canning and I made my first batch of apple pie filling and apple butter. I’ve noticed some people store there sealed jars without rings. Is there a reason for that? 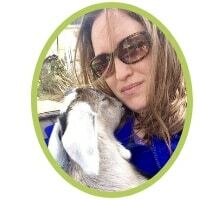 I’m a total city girl with a homestead heart! It’s best to remove the rings before storing. It prevents rust from trapped water and it is easier to see any signs of spoiling around the lid that might otherwise go unnoticed.